Edit - $90 suit deal is no longer available but do check out the store for cheap tailored clothes nonetheless! Suits have become a symbol of success in the urban jungle that we live in and are a must-have in every man's wardrobe. It is a need that you will find yourself obsessing about at some point in time, just because it is versatile and such a thrill to don (especially if you have a worthy one). From working professionals who understand the importance of looking poised and polished for good first impressions, to an average Joe who wants to look like a million bucks on an evening out, the suit is a transforming garment tailored to compliment your body. Today, Lifehacksg ventures into the field of tailors and textiles, going back to the age-old classic of the iron-pressed James Bond look to give you a makeover. Seah Im Food Centre located opposite Harbourfront is a pretty terrible food centre - our friends over atIeatIshootIpost agrees, as this may be the one food centre where you walk in and realize that none of the stalls are actually worth your calories at all. However, food aside, in the corner of the food centre lies a small cluster of stalls comprising of sundries and tailor shops. In particular, Lifehacksg#21 recommends Singai Garments and Tailoring (#01-11) for their affordable tailored dress-pants and full suits. 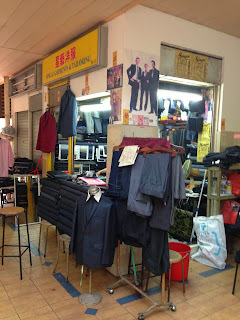 At this local, unassuming "mama shop", made-to-measure pants only cost you $40 apiece, or just $100 for a set of three. For full professional suits, we were offered a quote of just $90 for an entire suit set (top + bottom). Can you imagine how many outfits you can tailor with such a deal? Friends will be after your secret for a seemingly endless variety of expensive-looking items! After taking your measurements, the tailor will provide you with catalogs of various types of fabrics available for choosing. Lifehacksg made a purchase for three tailored dress-pants and were very impressed with the precision of the fit as well as the quality of the fabric. Now, we're not expecting Harvey Spector's standard of quality but the impeccable fitting might just pull off as an A grade knock-off for a millionth the price. Another plus point – the pants were ready for collection within just a few working days! In quick summary, to get perfectly-fitted tailored pants and suits at a very affordable price, head over to Seah Im Food Centre to visit Singai Garments and Tailoring! While you're at it, we would highly recommend getting a bowl of our favorite Tian Ji Niang Tou Foo stall (you won't miss it, there's a perennial line)!